Amid relentless sabre-rattling from Delhi in the aftermath of Pulwama suicide attack, Prime Minister Imran Khan has authorised the armed forces of Pakistan to respond “decisively and comprehensively” to any aggression or misadventure by India. At the same time, the prime minister has directed the interior ministry and security institutions to speed up efforts to root out militancy and extremism from the society as part of a comprehensive plan against terrorism. The authorisation and directives were made during a meeting of the National Security Committee (NSC) that the prime minister chaired at his office on Thursday. Having representation from the civil government and the military, the NSC is the top decision-making body on matters of national security. Participants discussed geo-strategic and national security environment and situation arising out of the Pulwama incident. They noted that the “state of Pakistan is not involved in any way, means, or form in the incident”. “It was conceived, planned and executed indigenously,” it added. India immediately blamed Pakistan after a young suicide bomber, a native of Indian Occupied Kashmir (IOK), drove his explosive laden vehicle into a convoy of Indian security forces, killing nearly three dozen soldiers. Not only that, India media and politicians also whipped up war hysteria in the country inflaming anti-Pakistan and anti-Kashmir sentiments among the people. 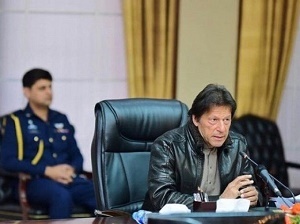 Premier Imran in a televised address to the nation not only offered India help in probe but also promised action if Delhi provided evidence of involvement of any Pakistani group. India, however, immediately rejected the offer calling it a ‘lame excuse’. On Thursday, the NSC reiterated the Pakistan offer with a hope that India would positively respond. “Based on the investigation or any tangible evidence provided, the state of Pakistan shall take action against anyone found using our soil,” it added. Pakistan alone has endured over 70,000 casualties in the process besides heavy loss to national exchequer. That is why the National Action Plan conceived and issued in 2014 outlined concrete sequenced measures with consensus of all political parties and institutions of Pakistan. “Having addressed direct threat to the state of Pakistan, we need to move to ensure that militancy and extremism are routed from the society and the state never becomes hostage to extremists,” the prime minister said. In this regard, he directed both the interior ministry and the security institutions to immediately accelerate actions on ground.